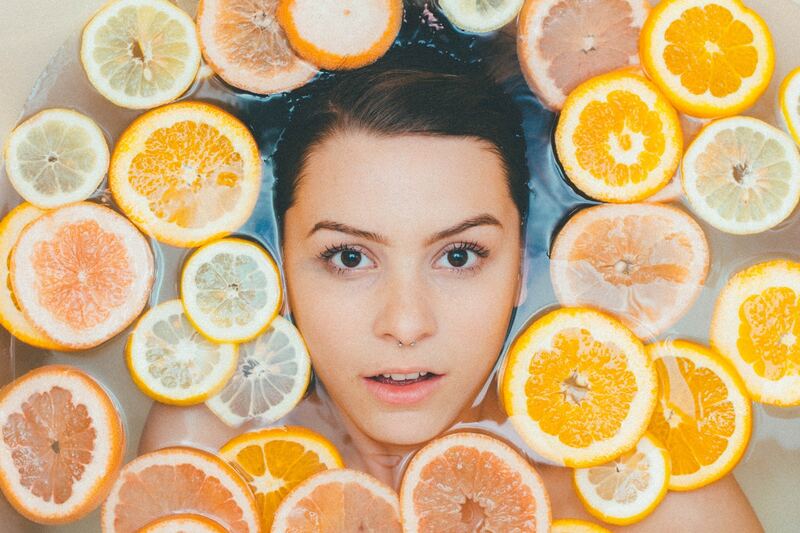 When it comes to having healthy skin, it's true that you are indeed what you eat and drink. According to leading dermatologists, nutritionists, and dietitians, having skin that is vibrant, glowing, and looking younger than ever can be yours simply by eating the proper foods and drinking the appropriate liquids. Whether you're in your twenties, fifties, or beyond, there's no doubt that by including these foods and drinks in your diet, you'll be looking and feeling great for years to come. If you want the healthiest possible skin, then you definitely need to be eating foods high in antioxidants. Known for protecting your skin from damage caused by the sun, antioxidants protect skin cells from disintegration, which helps to slow down the process of premature aging. So if you want to load up on antioxidants, then you'll need to be eating plenty of fruits and vegetables. Some of the best foods include strawberries, blueberries, blackberries, and plums. As for some of the best vegetables, artichokes, pinto beans, and black beans offer numerous benefits as well. Arguably the most important aspect of healthy skin through nutrition, essential fatty acids play a major role in producing fantastic skin. Responsible for healthy cell membranes that hold water in while letting waste products escape, fatty acids play a large part in helping skin cells produce plump, youthful skin. When it comes to fatty acids, the most important is usually Omega-3. The EPA and DHA is important because it protects not only cell membranes, but also our arteries. But don't go reaching for the fish oil or load up on fatty fish because they have their own set of complications. Opt for plant-based omegas like algae oil, flax, chia, and nuts instead. A mineral that's viewed as a game-changer when it comes to damaged skin, selenium can work wonders with various types of skin. For people who have high selenium levels, studies have shown the mineral can actually reverse damage caused by years of sun exposure. Therefore, if you want to build up your selenium levels, there are plenty of great foods you can eat. Our favorite is Brazil Nuts! After eating many of these foods, you'll naturally need something to wash them all down with, and most nutritionists agree there's no better choice than green tea. Held in high regard for many years for its numerous health benefits, green tea contains many anti-inflammatory properties that are great for healthy skin. In addition, it helps protect cell membranes and reduces the damage caused by ultraviolet rays, which can reduce the risk of developing skin cancer. If you want healthy skin, one of the easiest things to do is drink plenty of water. Most experts agree about a half-gallon per day is needed to have healthy skin, ensuring nutrients enter and toxins leave skin cells. In addition to this, staying hydrated helps skin sweat more efficiently, which keeps your skin clean and clear.